We have a long-standing relationship with Westmill, working with them for 12 years, creating marketing solutions for their wide range of ethnic food brands. For the TOLLY BOY RICE PACKAGING our brief was to update the design to deliver an innovative packaging range to capture the attention of the consumer on shelf. We sympathetically updated the original logo, bringing consistency in branding and colour palette, with an ethnic pattern adding depth and interest to the design and a clear window to view the product. 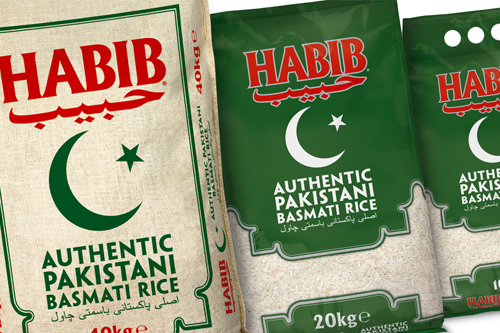 The HABIB RICE PACKAGING was in need of an update and we were tasked with creating a more premium, high quality look that also retained some of the original brand cues. Like the new Tolly Boy packaging the packs were printed on a new plastic substrate with an ethnic inspired window for product visibility. The SUNSHINE PRIDE BRANDING & PACKAGING was a newly launched Easy Cook Rice brand. We created the branding and vibrant packaging design, primarily to appeal to an Afro-Caribbean demographic and also to perform a tactical disruptive role on shelf alongside current competitor offerings. 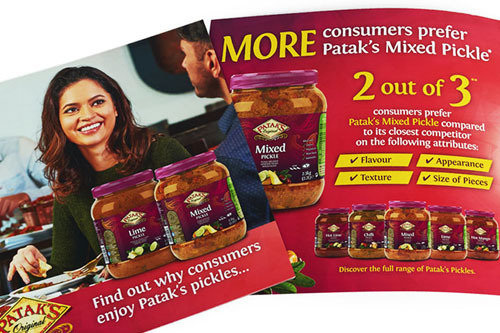 When Westmill carried out consumer research into their Patak’s pickles the results were extremely positive. This was essential information to communicate to their trade customers and explain the benefits of using the Patak’s brand over competitor products. We designed a PATAK’S SALES PRESENTER with supporting PowerPoint presentation to be used on a tablet, which included consumer sound bite videos to further endorse their research. A similar strategy was used when we designed the LUCKY BOAT ‘LOVE NOODLES’ BROCHURE – we project-managed and art-directed an original lifestyle photoshoot in outdoor, restaurant and kitchen locations to communicate the consumer’s enjoyment of Lucky Boat Sukiyaki noodles to their restaurant and takeaway trade customers. This campaign was also rolled out to a LOVE NOODLES CONSUMER CAMPAIGN with posters, adverts and voucher flyers produced for each of their restaurant and takeaway trade customers to promote the noodles to their customer base. Westmill products are sold through wholesalers and retailers and over the years we have worked with the marketing team to strengthen their in-store presence and drive sales through targeted marketing campaigns. 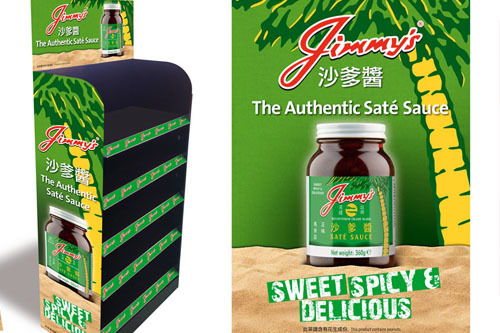 We developed the new look for the JIMMY’S SATE SAUCE POINT OF SALE using brand imagery combined with a beach setting and contemporary typography for a fresh modern feel used on in-store poster and FSDU, which was also rolled out on the new JIMMY’S SATE SAUCE WEBSITE. When Westmill were launching a new ‘everyday’ basmati rice brand, we created the DEVAAYA BASMATI RICE POINT OF SALE to engage new customers and introduce the range. Often promotional campaigns to Westmill customers need to be communicated in dual language, as seen in our design for the GREEN DRAGON FLOUR PROMOTION where customers would receive a visit from the ‘Green Dragon’ to generate brand awareness and engagement, supported by mailers and in-store point of sale. When the WESTMILL WEBSITE was in need of a full update, we designed an online brand presence to present their company overview, trade offering, showcase their brands and provide a portal for job vacancies. Each of their brands has a product page featuring product images, SKU listing, downloadable trade sheets and promotional videos. The website is responsive and fully updatable via a content management system. It also carries essential information on the Allergens used in their products. Following the introduction of new allergen regulations for all food businesses in 2014, Westmill were looking to support their customers and provide this information to them in an easily accessible and updatable format. 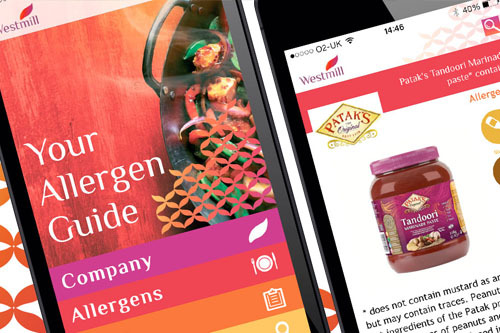 As well as adding a new page to the website that hosts downloadable allergen sheets for each of their brands, we worked with our digital partners to develop a mobile ALLERGEN APP, available across Apple, Android and Windows, that is a quick reference tool for their customers when creating their recipes and menus, ensuring they are compliant with the latest regulations.